The skeptic thread seems to have caused quite a stir, attracted lots of posts and whipped up a fair bit of emotion. This thread, and others initiated by the same author, is where the action is – certainly where there’s a lot of fierce, interesting, stimulating and compelling discussion. And yet this seems to have disturbed some course participants and possibly even course leaders. It seems difficult to get the balance right online. Either you just can’t get your students to engage in critical discussion – they are all too polite to each other, don’t say what they really think, perhaps don’t even have the necessary critical thinking, argumentation and debating skills needed for academically rigorous discussion or just don’t seem to want to engage the brain – or – they’re going at each other hammer and tongs. At the Networked Learning Conference in 2004, I was interested that the Open University was trying to tackle a lack of argumentation skills in their students and I often refer back to their paper when working with students online. In my own experience lack of challenge is always more of a problem than ‘flaming’ or the equivalent online behaviour. As with everything context is all important. If this were a small intimate online course (say 20-30 people), then the fierceness of some of the posts, however justified the content of the argument (and I am finding a lot of the arguments being put forward very thought provoking), could cause a complete collapse of the course, if it caused enough people to withdraw from posting. If it were a small course and I was moderating I probably would do some ‘back channelling’ to try and get the balance right. However, on a course of this size, I can’t see collapse of the course as a possibility and there is no doubt that the sceptic threads have added an energy to the course. connect through means other than moodle discussion forums – blogs etc. For myself, I haven’t felt the need yet to join the discussion forums. Presumably this means that I am not taking full advantage of this connectivism learning theory – am not connected? Maybe so, but at the moment it feels OK to me. Succumbing to the tyranny of participation? I have just made this blog public. I have kept quite a few blogs before but they have never been public. In the past I have invited a few people in and used them either as reflective journals or as a means of keeping my thinking about a given project in one place. This has always served my purpose in the past. However it seems that I can’t really test out this theory of connectivism unless I do go public. I do wonder though if there is a tyranny of participation. I first discussed this idea about a year ago with Vivien Hodgson, one of the authors of this paper. I felt a little bit of this tyranny when I read SDs article Seven Habits of Highly Connected People which for some reason made me feel uncomfortable when I read it. Here are some selected quotes from the paper – selected on the basis of my own particular biases. You have to read it all to get the full gist. So have I succumbed to a sort of tryanny by going public, or do I really need to go public to test all this out? Time will tell! My mind feels in a complete mess. I have spent my time on this course so far trying to work out how I am going to get anything out of it. I have read a little. I have tried to work out where I should be, what I should be reading, who I should be listening to, but so far without much success. With much trepidation I have posted my introduction, a reply and a comment – all very low key. 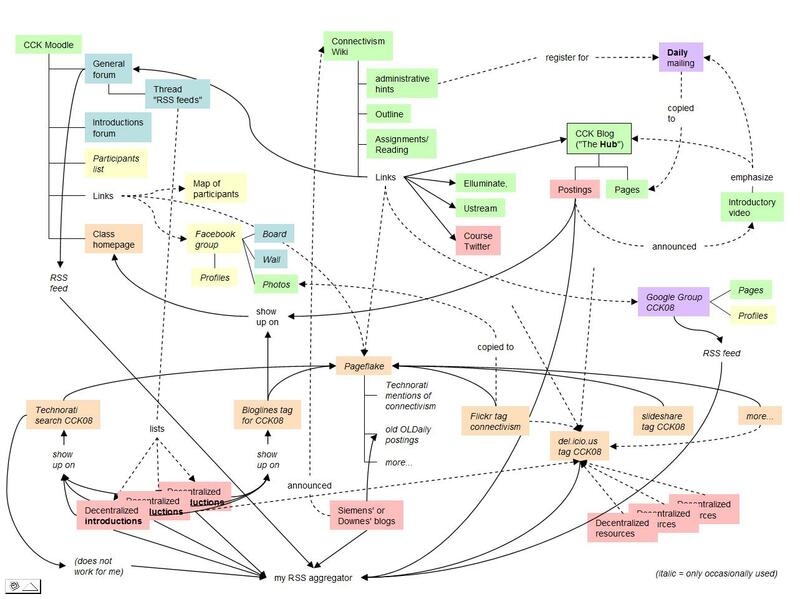 A map of the connections being made – produced by one of the participants – just made me realise how very unconnected I am.